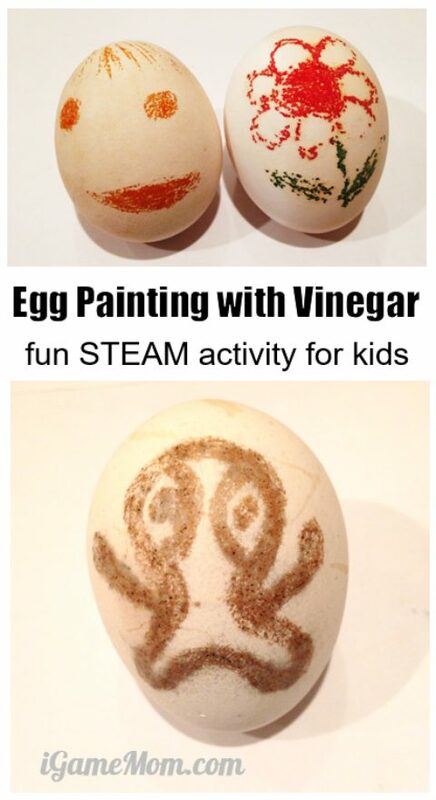 Egg painting with vinegar? 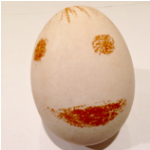 This is the most fun way of decorating hard boiled eggs with kids. A great STEAM project for science class too. It is a fun science craft activity combining science and art, and it started with an art app we were using to learn drawing. If you are STEM teacher, this is an ideal STEAM (Science Tech Engineer Art Math) project for kids. It is very easy. All you need are crayon and vinegar, and of course, eggs (preferably brown eggs). Several Easters ago, I felt I should do something about Easter, but we had pretty much out grown all the egg activities. It seemed hard to find something about Easter egg to get a boy’s interest. And then I came up the idea of using crayon to draw on eggs, based on what we learned from the app iLuv Drawing Monster, and then put the eggs in vinegar. It was mostly just me being curious about what was going to happen. In the end, it turned out pretty good. Most importantly, I had my ten year old into the mood of drawing and doing science experiments. Here is how we did it. First we picked a monster from iLuv Drawing Monsters and drew the monster in the app following the drawing instruction. Once we learned how to draw the monster, we draw it on eggs using crayon. While my son drew a monster, I drew a flower. Note: you want the eggs be at room temperature, since the crayon won’t work well on cold surface. Make sure the lines are thick, or the drawing won’t show up well after soaking in vinegar. We then put the eggs in vinegar for about an hour. While the rest of the egg shell was reacting with vinegar, the part covered by crayon did not. While waiting, we observed the little bubbles on the egg surface, and we were able to talk about the chemical reaction and where the air bubbles are from. 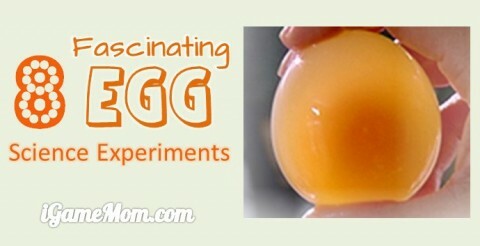 It is the reaction between acetic acid in vinegar and the solid calcium carbonate in the egg shells. The result of the reaction is calcium ions and carbon dioxide, ie. the bubbles we saw. After soaking the eggs in the vinegar for about an hour, we took the eggs out, cleaned them. We then boiled the eggs. The crayon melted and came off the egg shell after boiling. However, the picture stayed on the egg! You can see from the image what it looks like after we cleaned the crayon off the egg. For better effect, you want to use brown eggs. I am glad we were able to use the app doing something not on the screen, and we were able to cover some art and science in one activity. What did you do with some of the apps? Were you be able to do something not on the screen? I’d love to hear your ideas! 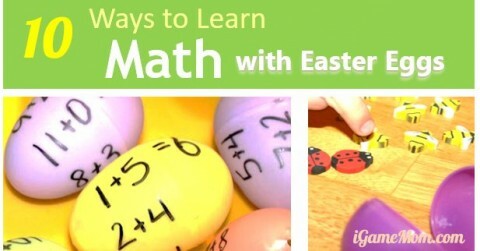 10 Ways to Learn Math with Easter Eggs. 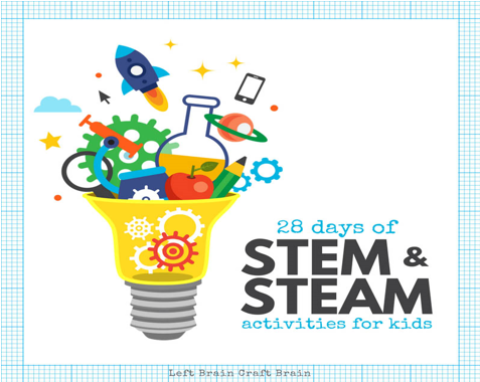 For more STEM Activities, visit 28 days of STEAM Challenge. This is how we did Easter eggs back in the 60’s. Mom bought the Paas Easter Egg kit at the store and it contained 3 or 4 colored fizzy tablets to put into different bowls filled with vinegar. It came with 3 or 4 different crayons to color on your egg and a wire loop to use to dip the eggs. Smelly, but fun! Thank you for sending all the great ideas for STEM. We use a lot of them here at the library where I work. Sounds like fun! I did not know there were packages like that. I am so glad to hear the ideas are helpful. Thanks for all your work at the library. We love ours. It is great you guys expand beyond books! Thank you. I like the effect too. I am just thinking, for some different effect, maybe add food color in vinegar? We did not eat them. Not because of soaking, more because of staying at room temperature for too long. I did try open one today, the egg white shrank quite bit. – so on the safe side, I would say no. Hmmm, had no idea it would do that! Very interesting! Thanks for posting! Ha, I had no idea before I tried. Glad it turned out ok.
I’ve never seen eggs decorated this way – so cool! I was happy with the result. My son was able to make couple more “monster eggs”, which was fun. Very EGGciting. thanks for sharing. Thanks for commenting. I am glad to find a way to engage my boy.